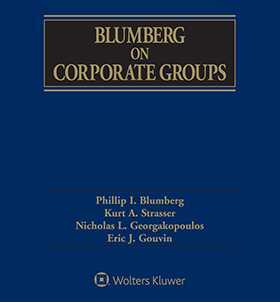 This five volume Second Edition of Blumberg on Corporate Groups provides a comprehensive treatment of corporate groups and the legal interrelationships of their component parent, subsidiary, and affiliated companies. It offers in-depth coverage of statutory and judicial law, federal and state, that affects parent and subsidiaries, franchisors and franchisees, licensors and licensees, health care institutions and medical staff and other corporate groups and provides the only comprehensive coverage of the key question: when the law will use more modern tools of enterprise law and look to the whole multi-corporation enterprise, and when will it use traditional tools and look to individual corporate entities? Traditional corporation law and "piercing the veil" no longer provide adequate guides to the law of parent and subsidiary corporations. In numerous areas, courts and legislatures are today allocating legal rights and liabilities according to modern enterprise principles. Blumberg's ground-breaking analysis of the law of corporate groups with thousands of cases and detailed review of major regulatory areas provides the bench, the bar, and the academy with a comprehensive review of the new legal principles at work.